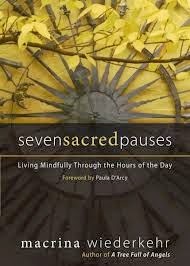 Seven Sacred Pauses is the first book I completed for 2015. I really enjoyed this book. It is a handbook written by a woman who lives in a monastery. It is an ancient tradition of monks to stop their busy work schedule 7 times a day to pause and reflect on God. I long to live with intentionality. I love to be present in the moment. I want to stop washing dishes and look my sweet angels in the eyes when they talk to me. A parenting mentor once told me that the dishes will always be there but they won’t always ask you to come play with them. “Throughout the hours of the day, whenever you feel stressed and overwhelmed, instead of pushing yourself to work harder and faster, remember to pause.” Exactly what God has been teaching me during these last 6 months that have been stressful. I have found the silence and solitude and pausing to reflect has been such an incredible gift to my life. This handbook has tools to guide you through the 7 times. Do I do all these every day? Not at all but when I even remember to pause for one or a few a day- it is sooooo good for my soul. Like right now I watch the orange glow of the pines in my backyard and it is magical. I gotta go experience it.